I love a good multi-layered mystery. This sounds like a page turner! I have also read No Time for Goodbye, I want to read all of his books, they are good mysteries even though sometimes you figure it out. I thought maybe thats his style. I have another one of his on my TBR list. Aha! Another series to draw me away from my responsibilities (like showering and feeding my children). I love good, solid, layered crime thriller series! Being satisfied is a good thing right??? Sounds like an author I need to check out! I love Linwood Barclay. So enjoyed the book you gave me for Christmas that I've bought a bunch of his other books since then. Finished this one last week and loved it! I have Fear The Worst on my shelves. I have to still give it a read. I read your other review as well, and it seems as if these are a nice distraction. Linda - I've seen you express your love of Linwood on your blog! Nicole - Fear the Worst has a cool premise. I'd like to read that one too. The cover makes this seem like a really scary book, but the mystery intrigues me. I may have to check this one out! I haven't read very many mysteries, but this one does sound good! I like the fact that it is very multi-faceted and I am really glad you enjoyed it. Off now to look it up and add it to my wish list! I'm a sucker for a good mystery - thanks for the recommendation. Would be interesting to see how the family dynamics play into the novel as well - the wife's depression seems like it could play a big part. Glad that you enjoyed it. I enjoyed the newspaper references, having worked at one for 33+ years. I LOVED THIS BOOK! 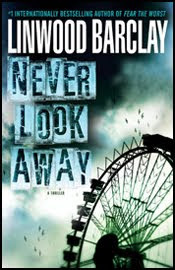 I just finished reading “Never Look Away”, by Linwood Barclay.I recently discovered this author and boy am I glad I did. His stories are the kinds that you want to finish in one sitting. Filled with intrigue, “Never Look Away” kept me captivated from page one until the very end. Yet another satisfying novel by one of my new favorites. Well done! I eagerly await his next thriller. The only one I've read is the one you read first. I really liked it, so I'll have to find some time for this one.